TRANSFORMING HEALTH – Prescriptions for opioids fell 29 percent nationwide from 2013 to 2017, according to Blue Cross Blue Shield Association. 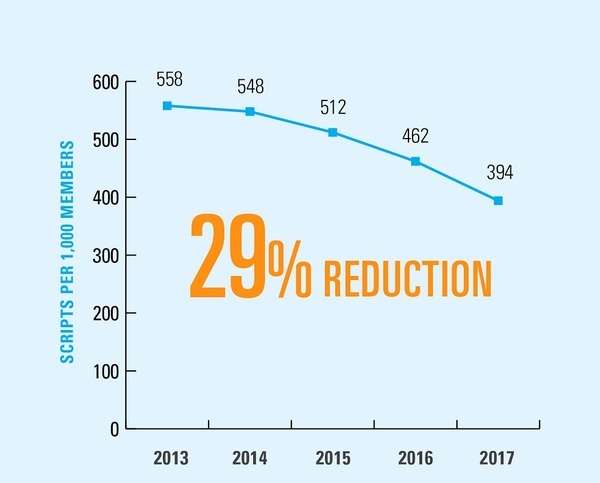 In Pennsylvania, which has one of the highest rates of opioid addiction, doctors prescribed 35 percent fewer prescriptions over the five-year period. The report shows a turning tide after some states implemented tougher laws against long-term opioid prescriptions and as more doctors turn to non-addictive alternatives, said BCBSA Chief Medical Officer Trent Haywood. In Pennsylvania, 2016 legislation limited opioid prescriptions to a seven-day supply in most cases, limted refills and put resources in place for those at risk of addiction. Still, the report shows that 240,000 people in BCBSA’s 41 million person dataset were diagnosed with opioid use disorder in 2017. While that’s down slightly from the previous year, that number is a sobering reminder that opioid addiction will continue to be a public health crisis for years to come, Haywood said. Blue Cross Blue Shield is rolling out plans to combat addiction by increasing patient access to medication assisted treatment and by setting up a hotline for people to find local resources.